One of the interesting dynamics in the mobile device industry is the integration of several form-factors in the same device. 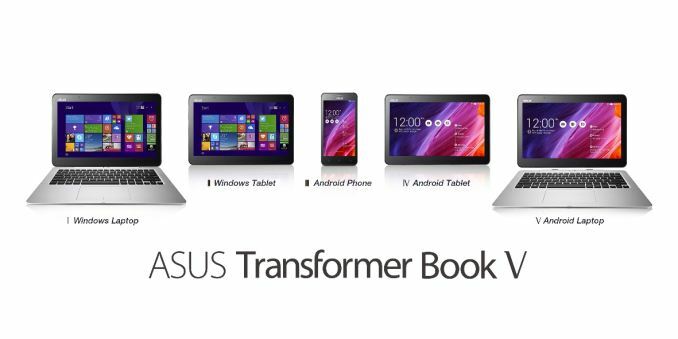 ASUS has been a major proponent in this, with their FonePad, PadFone and Transformer Book. Coupled on top of this is the use of Windows and Android in various forms across the systems, so naturally there should be one device to cover all usage models, right? 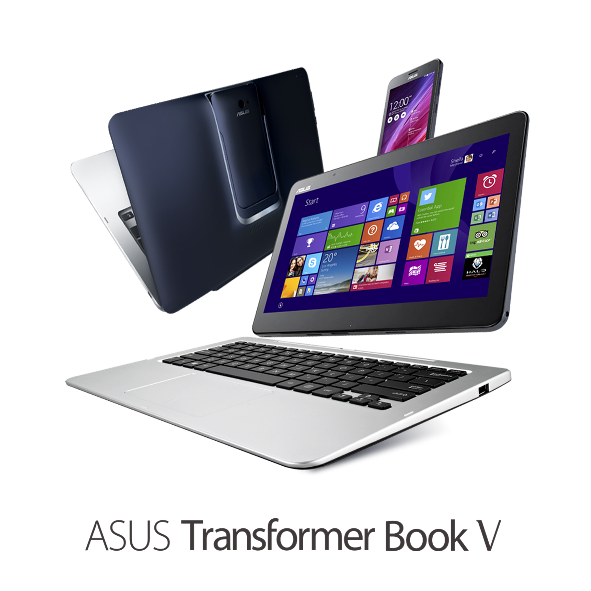 This is the Transformer Book V, a five-mode capable, three-in-one converged laptop, smartphone and tablet. The three parts are a 12.5-inch tablet, a 5-inch smartphone that docks into the tablet, and keyboard that also docks into the tablet. The tablet component uses a next-generation Intel Core processor (suggestions are pointing to low-powered Broadwell) with up to 1TB of storage. There was no indication of resolution, but the panel is IPS. The smartphone is a 5-inch LTE device with an Intel Atom quad-core device, powered by Kitkat 4.4 and a 2500mAh battery. Storage is set for 64GB eMMC with 2GB LPDDR3. The tablet segment has 128GB eMMC storage with 4GB of LPDDR3, which suggests that the tablet dock contains the 1TB as a secondary drive. A small button on the tablet helps switch between Android and Windows. Given the suggestion that the device is aimed at Broadwell and the lack of specifications for the resolution, DRAM storage and so on, release would presumably occur based on Intel’s timeframe. So nearly the perfect device. Only if there was a digitizer. I think people would complain about the phone protruding from the surface and how that's the next worst thing to a broken fingernail. But I see a near perfect device. However i am still curious how the tablet will feel when the phone is detached. i.e. with an empty slot. The phone pad concept has always impressed me. Especially so, because the tablet is just an extension of the screen for the phone. The hassle of having the same accounts and app collection on two different devices has kept me from owning an android tablet. This looks like a good solution. If broadwell low power (Y series) is as powerfull as haseell U series, I am perfectly alright with that. But man, 8gb RAM would be so close to being perfect. "The hassle of having the same accounts and app collection on two different devices has kept me from owning an android tablet. This looks like a good solution."